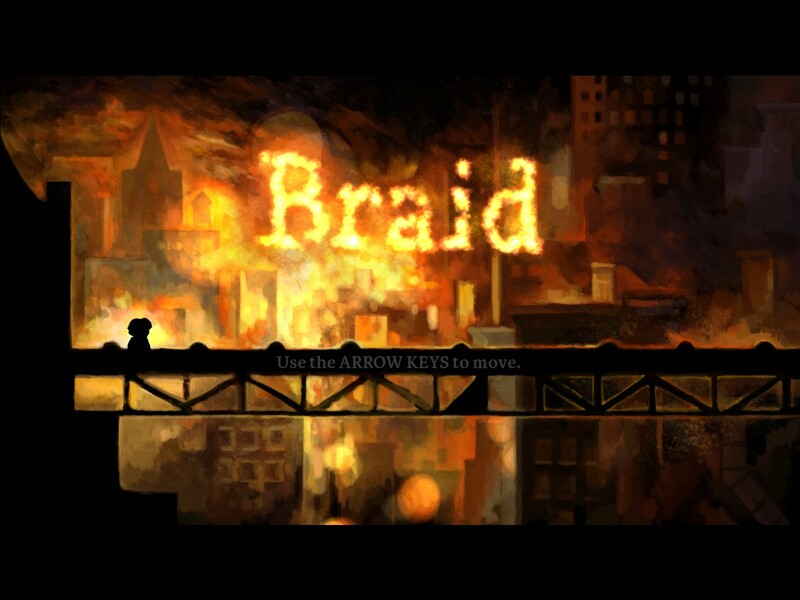 Braid is widely held to be a masterpiece. A hugely popular indie game with innovative mechanics, some excellent puzzling, sarcastic nods to platformers past and an interesting and grown-up storyline. My playthrough of it lasts about a minute and a half. I move right at the game's behest, climb, jump, bounce on an enemy's head, collect two puzzle pieces and then collide with an enemy and die. There's two ways to address that: One, assume that the time rewind option isn't there unless required to solve a puzzle in which case I'm dead. Or two, count being able to rewind time as meaning there's no lose condition, in which case I shouldn't be playing Braid at all. I'll fill the space with some ideas which were revealed to me the last time I played Braid though, so it looks like I'm working for my hits. I do not play video games for their stories. I read books and watch films for stories. Video games fill a different role for me. For me, they are like sport or board games. There is a set of rules, and it's how you play within those rules that reaps you rewards. The 'narrative' is a personal one of development. Increasing power and choices, increasing understanding of the games mechanics, increasing chances and level of success, increasing skill and judgement, these are what I find gripping. So Braid's 'clever' story is of no interest to me. However, puzzle games are right up my street: logic, engineering, problem solving and so on. I love being presented with a series of obstacles and a set of skills/objects. I love slowly working through the options, and then that flash of insight when the final step appears in your mind and you KNOW you've cracked it. It's compelling, and definitely fills me with a feeling of accomplishment, as well as an overblown opinion of my own cleverness (which is always a bonus). There is one thing that sours a puzzle game for me though, and it's something I've noticed in a few highly lauded puzzle games of late. The joy of a puzzle game is about finding the solution. Working through the steps, using a bit of lateral thinking, trial and error - anything that it takes to reach that flash of insight. However, once you have had that flash, you should be able to complete the puzzle instantly. What ruins that whole process is when you solve the puzzle, and then you have to attempt the steps 8 or 9 times in order to actually complete it. When there is an element of perfect timing to the solution of a puzzle my rage meter starts to build at a ferocious rate. I've done the fun bit, I've had the euphoric eureka moment, and now I'm stuck trying to time a hideous gap jump. And not only that, if I fail the jump then I have to go back and do three or four more tedious steps to get the block that I need to push onto the button to open the door that causes the boulder to land on the seesaw that I need to jump off to reach the key. If I have to try that jump 5 or 6 times then that game will have a black cloud above it for the rest of my life. I can see how this idea can add a new dimension to a puzzle game. The difficult thing is to keep the puzzles fresh and adding skill elements certainly does that, but I'd personally rather it was an hour shorter than have me flail around trying to catch a rope that only has a catchable window of 0.5 seconds over and over and over. Alas, Braid does this, and I'm sure I'll be roundly chastised for letting such a 'small' thing colour my view of a very good game, but what can I do? I like what I like! I totally agree with your criticism (in principle) but I don't recall Braid being a particular offender.